I am thirsty all the time. It’s rare to find me without something to sip on all day and into the night. I would like to say that I’m virtuous enough to limit my drink choices to abundant amounts of ice water and perhaps the occasional glass of milk, but alas, that would be untrue. Instead, I’m nearly always within arm’s reach of a diet soda. Well-meaning friends have warned me of the dangers of artificial sweetener, trying to “scare me straight” with threats of everything from insomnia to cancer. Numerous loved ones have cited studies that seem to show an ironic link between weight gain and diet soda consumption. Well-respected dental and medical professionals have warned of tooth staining and osteoporosis from diet soda consumption. Once I even tried to break myself of the diet soda habit by calculating the cost of buying soda each week. As it turns out, if I buy the soda on sale, it doesn’t really amount to much. I’m a reasonably intelligent individual, and in general I take good care of myself, but in this one small area I’m kind of a disaster. It’s not that I don’t like water, but day after day, year after year, it’s just so boring. Overcoming what a friend of mine calls “water boredom” is tough on my taste buds. With temperatures warming, however, and my thirst ramping up for the season, I’ve been experimenting with ways to add some pizzazz to my water and decrease my consumption of artificial flavors and chemicals. Making water more fun is clearly an idea that has caught on. Pinterest and the Internet are chock-full of ideas for giving water a little lift, making it visually appealing in the process. Lemon water is, of course, a classic combination which some people think may have some disease-fighting properties and aid digestion. But lemons are just the beginning, especially at this time of year when produce is abundant and people are hankering for something to quench their thirst. At a party I attended recently, the hostess combined strawberries and basil in a pitcher with lots of ice cubes and water. The red and green of the berries and basil provided a beautiful pop of color to the table and gave the water a subtly sweet and savory flavor. On a really hot day, lime and cucumber slices in water are exceptionally refreshing, and the flavor is surprisingly bold. Really, the sky’s the limit for flavored waters; just about any fruit or veggie you like to eat can give your ice water a little zip. Herbs and other plants like mint and ginger are great too. If you need something a little more pronounced, add a few ounces of pure cranberry or grapefruit juice to your water for a not-too-sweet refresher that provides a healthy dose of vitamin C.
Rather than juicing lemons by the dozen, powdered citric acid is added to water, sugar and a few other ingredients. Way back when, citric acid had to be special ordered from the local pharmacy. Nowadays, I order it quickly and inexpensively from Amazon; a small bag or jar will last all summer even if I make several batches. 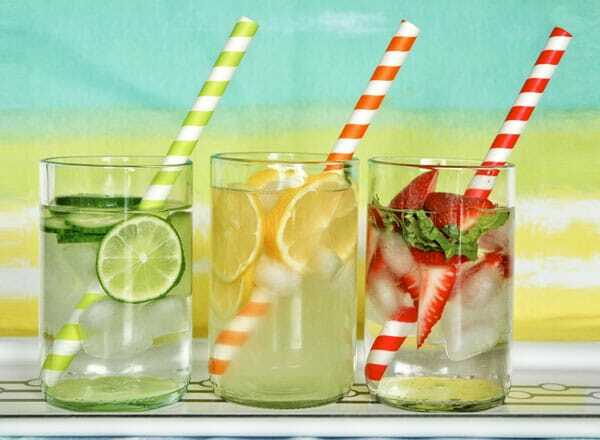 And while it’s true that Good Water has a pretty powerful dose of sugar, it’s also a great way to up my water intake, which makes it a simple and sweet summer treat. Order citric acid powder online; feel free to decrease the sugar in this recipe according to your preference. Stir water, citric acid powder, sugar and lemon extract together until sugar and citric acid powder are dissolved. Add ice cubes and garnish with lemon slices.